Bored with the same old scrambled eggs? This frittata with greens and goat cheese is super easy and ridiculously delicious. It whips up in minutes with just a few basic ingredients but tastes like you slaved all day! Better yet, use leftover vegetables and meat for an effortless meal your whole family will love! I think eggs are a superhero food. Isn’t it mind-blowing how versatile they are? Just think about it for a minute…all the ways you can use eggs (unless you’re vegan and you use egg substitutes). I associate two feelings with eggs: happiness and fear. Why? When I was a tiny little skinny girl, and before our food was polluted, mom would reward us with an egg dessert when we behaved well. The “dessert” consisted of either raw egg white or egg yolk and a cup of sugar beaten until fluffy. Luckily, my brother liked the whites and I the yolks, so nothing went to waste. When I think of that concoction now I throw up a little in my mouth, but back then it was the meaning of pure happiness. Fast forward some years and I’m a young mom feeding my baby with a hard-boiled egg for the first time. She started to choke. I still get goosebumps just thinking about it. That fear of losing her was indescribable. Eventually, the eggs and I met in the middle and developed a normal relationship. But I still think they are super cool. Don’t you? I especially love frittatas and omelets because you can use any leftover veggies and meat to make them, like in this bacon and greens frittata. What’s the difference between frittatas and omelets? Short answer – the difference is in the cooking method. Both are easy to make. 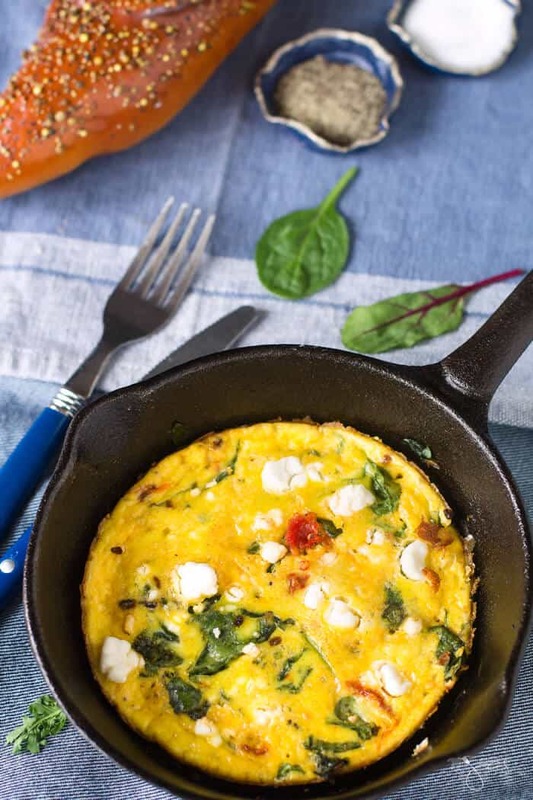 FRITTATAS are made by mixing the eggs and cream with ingredients such as vegetables, greens, herbs, cheese, and sometimes meat, then first cooked in a cast iron skillet or oven-safe pan on the stovetop and then finished in the oven. Frittatas are more like a crustless quiche. Cooking from the stovetop to the oven is so easy with a cast-iron skillet! It’s a staple in every kitchen and you will love how many meals you can make using your pan. It’s pretty much the only one I ever use. 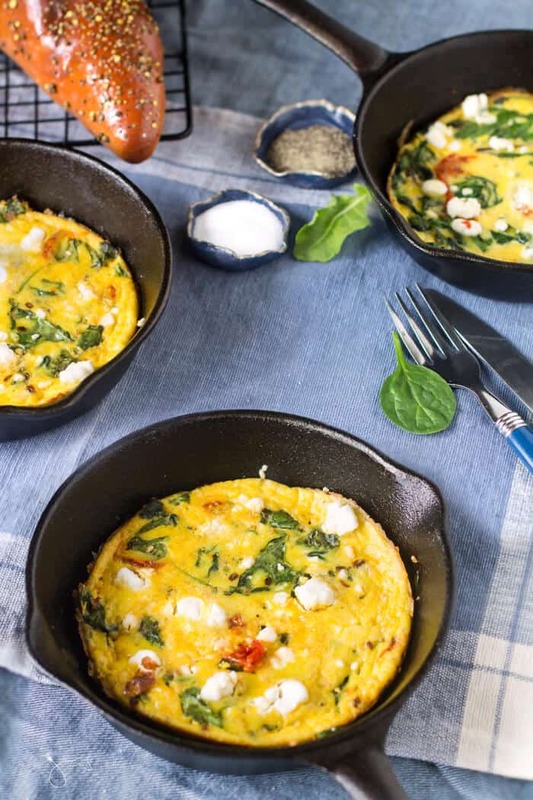 Make this frittata in a large 10-inch skillet or 4 little ones (I only use them when I have overnight guests to serve individual frittatas, because they look so fancy, ha!) Check out the ESSENTIALS box below. OMELETS are made by mixing the eggs with milk and then cooked in a frying pan on the stove. You let the eggs cook without stirring until firm, then sprinkle with the filling and fold the mixture in half or in thirds to enclose its contents. So next time you reach to make scrambled eggs, look what else you have laying around in the fridge. You’d be surprised how easy it is to create different flavors by mixing just a few new ingredients. Greens and goat cheese in combination with sun-dried tomatoes brighten the flavors of the frittata and you will definitely agree this dish is not only good for breakfast or brunch but deserves to be on your lunch and dinner table as well. Substitute goat cheese with feta cheese. Instead of mixed greens, use only spinach. Serve either in one large or four small skillets. Top with hot sauce or sour cream. In a large bowl, whisk together the eggs and cream. Season the mixture with salt and pepper to taste. In a large cast iron skillet, 4 small skillets or ovenproof frying pan heat the olive oil over medium heat. Fry the shallot until softened, about 5 minutes. Add the garlic and sun-dried tomatoes and fry for a minute longer. Stir in the mixed greens and cook, stirring continuously, until wilted. Pour the egg mixture over the vegetables and cook over a low heat until the edges have set and started to come away from the sides of the pan, about 10 minutes. Sprinkle evenly with goat cheese and transfer to the oven. Bake the frittata until slightly golden and set, about 5 minutes. Greens and goat cheese in combination with sun-dried tomatoes brighten the flavors of this frittata and make it a perfect meal for breakfast, lunch or dinner. Substitute goat cheese with feta cheese. Instead of mixed greens, use only spinach. Featured on: Pieced Pastimes, A Pinch of Joy, Domestically Speaking, and A Fireman’s Wife. My tummy is growling!! These are perfect and I would like to have this for my breakfast or brunch tomorrow! Thanks for sharing this yummy dish at Fiesta Friday party! 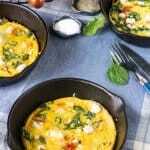 Your frittata looks so appetising and I love the mini skillets you have presented them in! The mini skillets look gorgeous! 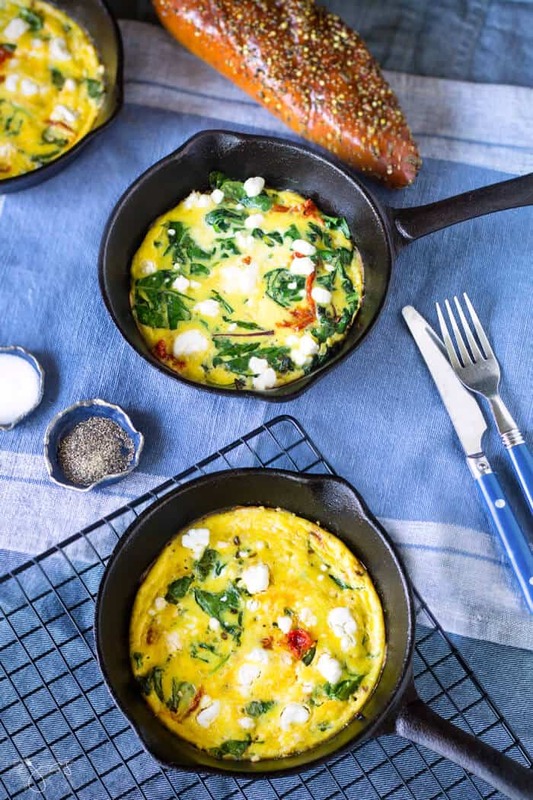 I need to invest in those so I can make these lovely looking frittatas! It’s so versatile and easy to make. Thanks for stopping in! I love these! I mean, I’ve made plenty of frittatas before, with various goodies and cheeses, but I never thought about using the small skillets. I bought some little ones a while back to make fun Dutch babies for my grand kids, but a single serving frittata is brilliant! Thanks! These look so good! I am totally guilty of the boring scrambled eggs most every morning! I definitely want to give this one a try. Thanks for linking up and you will be the featured post for this week! I love both-omelets and frittatas and this looks awesome in mini skillets. I want to pin it but my Pinterest site is not working for few months. Your frittata looks so good. I need to get some goats cheese, a great idea for this dish that is at home for any meal. Thanks, Kathleen! I love goat cheese in and on almost everything, lol. Haha, I wish there was a restart my day button, Karly! Thanks for stopping in!